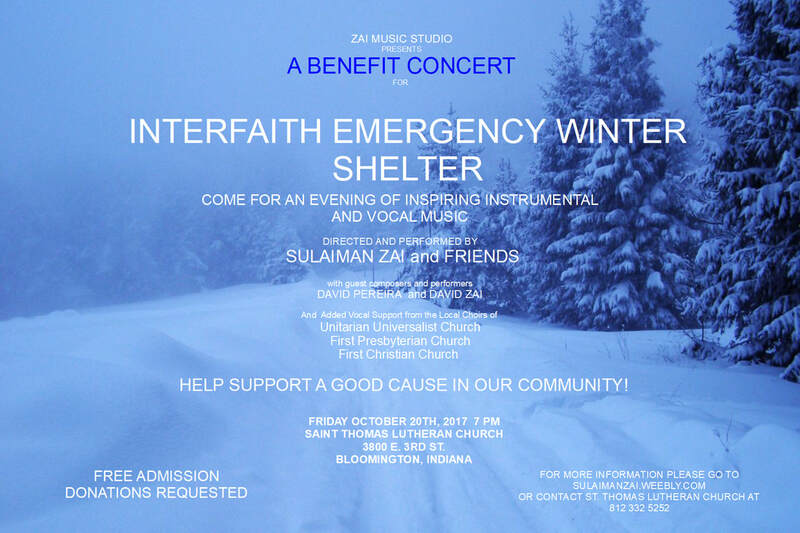 A fundraising benefit concert to help Interfaith Emergency Winter Shelter in Bloomington Indiana. The concert is written and directed by Sulaiman Zai for a group of forty musicians from Bloomington as well as players from out of town and abroad. 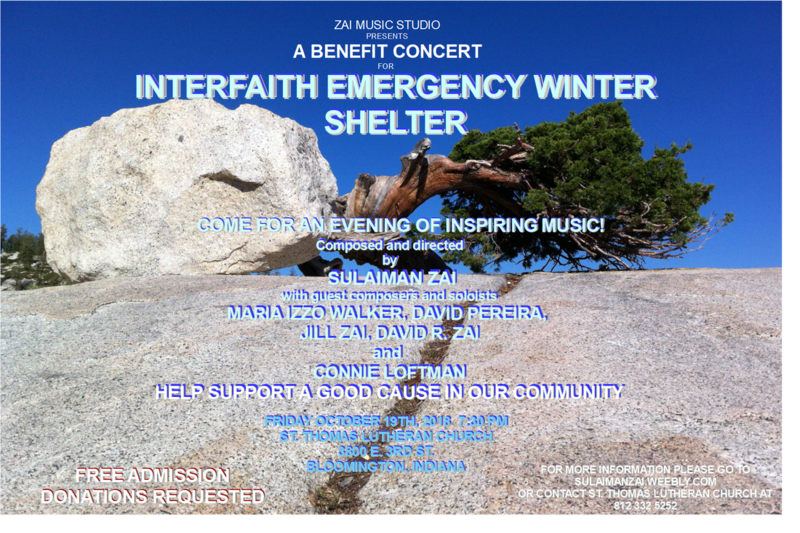 The concert will also feature guest performers and composers David Pereira and David R. Zai. Volunteer choir members from Unitarian Universalist, First Presbyterian and First Christian churches in Bloomington will offer additional vocal support, thanks to choir directors Sue Swaney, Katy Strand and Jan Harrington respectively. The performance will be on Friday October 20th, 2017 at 7 PM at St. Thomas Lutheran Church, 3800 E. 3rd St. in Bloomington Indiana. 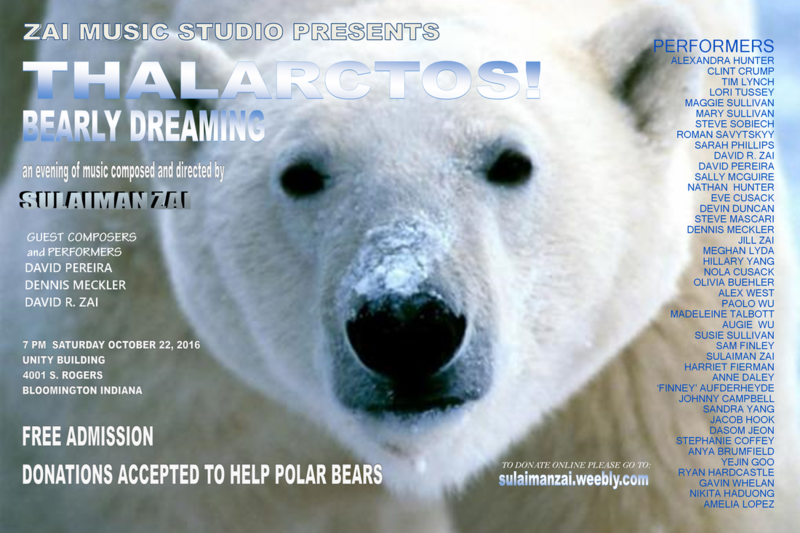 Admission is FREE and donations will be gratefully accepted. All proceeds after production costs will be given to Interfaith Emergency Winter Shelter. Please come and enjoy this heartfelt performance of instrumental and vocal music and help support an important cause in our community. 6:30 PM AT FIRST UNITED CHURCH 2420 EAST THIRD ST.
WORKS BY MUDARRA, PONCE, VILLA LOBOS, BACH, SOR, GIULIANI AND MORE!